Sorbet is essentially a non-dairy frozen dessert, often (but not always) made from fruit puree or fruit juice. The most tricky part when making sorbet is balancing the sugar levels of your sorbet base. Regardless of how your base tastes, it must have the right sugar content to freeze correctly. 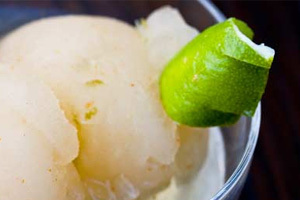 If the sugar content is off, your sorbet will either refuse to freeze completely or freeze too hard. Fortunately, the sugar content of a liquid affects the buoyancy of objects floated in it. Chefs who make a lot of sorbets use a little floating device called a Baume meter to measure the sugar content of a sorbet base. But you don’t have to buy one. A raw egg in the shell will work just as well. Just remember to thoroughly wash the egg first, and be very gentle with it. If it breaks, you’ll have to throw out the sorbet base and start over. Float the egg in your base, adding simple syrup to make it float more and plain water to make it float less. You’re looking for the diameter of the egg showing above the surface to be between that of a dime and a nickel. There are sorbet recipes that include standardized ingredient amounts that will give you a decent sorbet every time. However, balancing sorbet sugar levels yourself will result in a better dessert, as fruit varies in its sugar content from harvest to harvest. Always chill your sorbet base completely before you use your ice cream machine to freeze it. The longer it takes the mixture to freeze, the larger the ice crystals will be. Colder sorbet bases make smoother sorbets. Cold reduces the intensity of flavors. When tasting your sorbet base, assume it will be milder when frozen, and make it stronger than you would like the finished sorbet to taste. Don’t be afraid to experiment! While simple fruit sorbets are the most common, fine dining chefs often include other flavors to add nuances to the finished product. 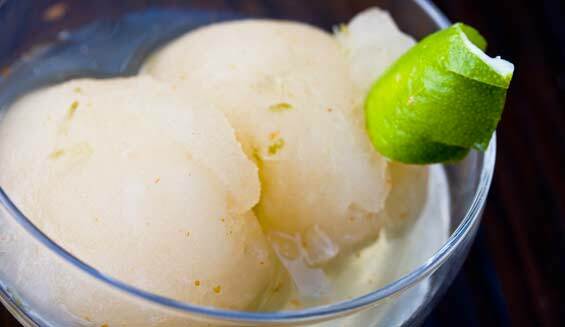 Adding ginger, fine vinegar, ground dried chilies, fresh herbs, spices or some other layer to your fruit can really take your sorbet to the next level (just be careful to augment rather than overpower the main flavor). Check Out Our Ice Cream & Sorbet Recipes Collection!